I've only ever tried Xinjiang food at the BLCU Muslim restaurant where I chowed down on skewers of meat, baked flatbread, and yoghurt drinks. Unfortunately, I'm not a big fan of lamb or oily food so Xinjiang cuisine never really makes my top eats. However, this Xinjiang restaurant is always bustling every night and has earned quite the reputation for authentic Xinjiang cuisine so I had to give it a try. Tofu with preserved egg and an interesting sauce. Nice and cooling but I prefer the one my dad makes at home :) Huge portion though! Unfortunately, they were out of the lamb dumplings and the lamb shank requires pre-order so we ordered the lamb rack instead. Like I said, I don't really eat lamb but I had a tiny bite of this and it tasted really gamey for those of you who like lamb. Pretty okay meal but I won't be rushing back - my favourite part of the meal was actually the tea they serve which is particularly soothing and I can't quite place what kind it was. This is a newly opened restaurant on Water Street and we ducked in for a quick meal of Hainan chicken rice. Quite a hefty portion to split between two, there was a lot of meat on the chicken pieces and I liked how it came with peanuts! Unfortunately, the meat wasn't deboned and the slices were a tad too chunky - but overall really decent for the price and the sweet sauce which accompanied the dish was spot on. We had decided to split the serve of chicken and ordered rice and soup on the side ($12 and $5 respectively). 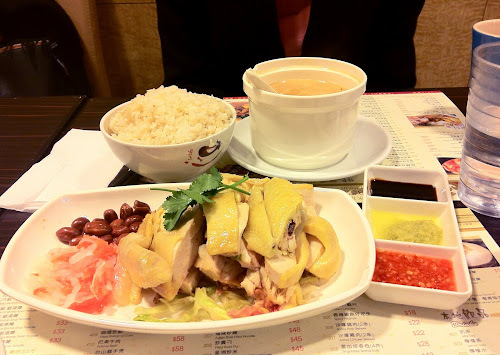 You can also just order the hainan chicken rice set for $50 which is much more hassle-free! The rice is pretty okay, but the soup tasted different from the usual variety. Nevertheless, still comforting on a cold night!